You are here: Home / iphone / How to make your headphones, microphones louder on iPhone, iPod, iPad or AirPods? If you are looking for improvement in call quality, louder microphone, increase volume of your iPhone, iPad, iPod or even AirPods then you are on the right page. This simple step by step guide will help you to resolve every issue you have with iOS devices sound or volume without using any external App. Just look for the right section in this post and follow instructions. 1) How to make your headphones, microphones louder on iPhone, iPod, iPad or AirPods? 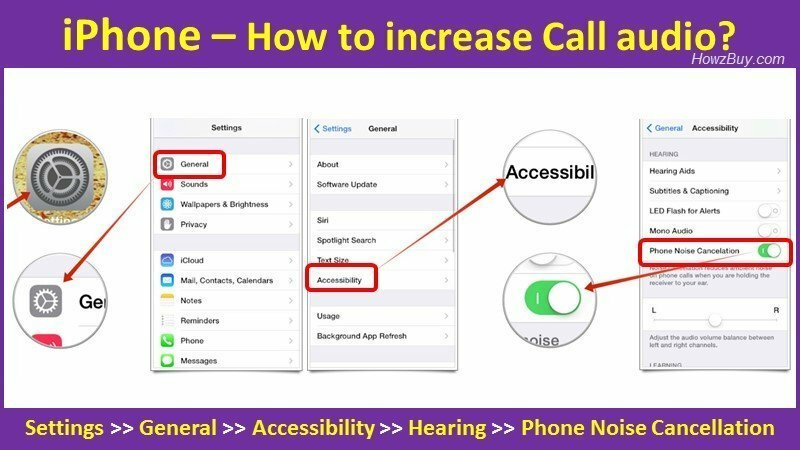 2) How to improve the audio quality of calls on iPhone? 3) How to Make the iPhone Microphone Louder? 4) How to make Airpods Louder? 5) How to restrict volume on iPhone, iPod, and iPad? Many times when you are listening to old songs or online videos for say cooking related which are published by someone who is not a professional but good at cooking, then you still want to listen to them on your iPhone or any iOS device using classic iPhone headphones or the latest AirPods from Apple. But since the volume of such online videos or sometimes calls is so poor that you can get frustrated since the iPhone or iPad is unable to play volume louder than the maximum settings and you feel exhausted with options. But believe me, there are simple options that you can try even without downloading any third party Apps. Some of the options that I am going to suggest are simply twicking in the built-in settings of iPhone which you have never thought of adjusting or playing with, and yes, it will also help you changing volume on individual songs using iTunes. Yes, before you go for doing a PhD in volume, lets do a basic sanity check if the iPhone headphones or AirPods settings are right and you are able to use the volume control on your iPhone right. So the easiest way is to pressing the “Volume Up” button on the side of your iPhone while music is playing. Note : If you are not playing music, and still press the “Volume Up” button, it will change the volume of the ringer instead. Another way is to swipe upward on the screen (or downward on the latest iPhones like X, XS or XS MAx) to bring up the Control Center, where you can directly adjust the volume even without playing the music. Having done this, and still you are not able to hear properly, then get on to the next step. If the basic settings does not work, there is next way to get on the Volume Limit settings and change it. Yes, iPhones by default do have a volume limit for music to prevent harm to your ears. OR someone has twicked it and set it to Low, that may be the case. Go to “Settings” >> “Music” >> Look for “Volume Limit” under the “Playback” header >> “Max Volume” slider. If the Volume Limit is ON, then click on it to go to another page that shows a “Max Volume” slider. Change this slider to Maximum which will make your headphones LOUD. Above settings of the Equilizer “EQ” section of the Music settings are found accidentally and published over internet, became famous trick overnight! Somehow these “Late Night” settings results into a mixture of louder volume and high quality. How to check if the late night settings are effective? Its simple to check or test the sound level difference between Late Night and the default EQ “off” setting is by using a background music app like Apple Music, Spotify, or YouTube Music. This allows you to play music while you adjust and play with your EQ settings, so you can hear changes in volume and quality in real time to appreciate the results. And with these Late night settings I was able to get full more aggressive sound. Of-course the default EQ mode sounds more balanced and soothing, but as said I used this only to listen to poor quality audio on YouTube homemade videos. Finally when I tested this Late night settings with my external Bluetooth speaker, the music was much louder than the default setting at the same volume notch. Even when I tried adjusting other settings such as Bass, Mids, Trable to fit genre or setting, Late night setting is simple and quick way to switch over for short duration listening. Now this is something you can do only with iTunes. Goto iTunes and select a song you want louder volume (or any other volume settings), when it starts to play, adjust the slider under the album art and play the controls to increase the volume to make it louder. Since each song in your iTunes library has an associated playback volume, you can typically choose silent songs and make them louder or visa versa, making jazzy songs silent! This is good since only a few songs are like this and all remaining songs will play at default volume settings, as against all other approaches results making overall all songs louder even though not needed. Someone may feel it time-consuming, to do for each song! its the way you look!! Now you have dealt with making the headphones or speakers louder. But what if you want to improve or twick the audio quality of calls? There are situations where the background noise makes the conversations very difficult, like talking with someone on subway or train or busy airport! The person on receiving end is simply unable to understand what you are saying. So all the latest iPhones with iOS 7 or later like iPhone 8, X, XS, XS Max you have a way out to improve the call quality using the noise cancellation. Well this does not mean that you will get super quality phone calls, like a real NC headphones, however surely this reduces external noises to the great extent, which is specially useful in busy environment. Then do try it and let me know in comments section, how much you feel this facility is useful? iPhone has facility to adjust the microphones manually during a phone call or audio recording. Although the default settings are done to suffice all normal tasks, sometimes you may need to improve on the microphone sensitivity. Step-1) Tap “Settings” and “Sounds” on your iPhone. Step-2) Slide the “Change With Buttons” slider to the “On” position. Step-3) Press the “+” button on the side of the iPhone to increase the overall system volume. Press the “–” button to lower the volume. This affects the volume of the microphone as well. Yes, it is located in a small hole between the camera lens and LED flash on the back, the microphone hole above the speaker on the front and the microphone near the headset jack hole. Step-2) Use small brush yo clean up the openings of each of the microphones on your iPhone. The direction of brushing shall be such that you move brush away from the dock connector, this will avoid getting any debris inside the connector port. Step-3) Now goto the microphone jack on the bottom of the iPhone. Follow the similar process to brush any debris from inside the headphone jack. Step-4) Turn the iPhone OFF by holding the “On/Off” button on the top of the iPhone and then swiping from left to right on the “Slide To Power Off” switch. Step-5) Use compressed air to clean the microphone openings and the microphone jack (you can use bottled compressed air can), this will remove the loosened debris using a brush. Do this by short bursts of one or two-second intervals and by keeping the nozzle about 1 inch away from the holes. Step-1) If you are using any protective covering / waterproof case, then simply remove it and try calling. The covering may be limiting the performance of microphones. As a thumb rule, hold the microphone up to 12 inches from your face with the built-in mic facing you during recording. Or Hold the phone as you would when on a normal telephone call and avoid putting your face too close to the microphone. Step-3) If you are using a headphone with built-in microphone, then keep the cord away from the face, let it hand freely, most of people makes mistake of holding it near to mouth considering that it will help, but remember it won’t. Keep some optimal distance from mouth to microphone to perform them better. Step-4) Rebooting the iPhone – Yes, the age old trick working since old windows days! sometimes the software malfunctions making the hardware performing poor. So hold the ON/OFF switch for few seconds, then “Slide To Power Off”. Press the “On/Off” switch again to reboot the iPhone. Step-5) One more thing which works on many problems is the firmware update or software update. To do so, goto the “Settings” app >> select the “General” option >> Select “Software Update” and install any available updates for your iPhone. Having said that AirPods is the most used form of headphones for any iPhone in this world, its necessary to learn ways to increase the volume of Airpods. Somehow many settings on iPhone are not intuitive! Most of the people are not able to figure out how to adjust the volume on your AirPods without any visible buttons and dials! So lets look at two options to increase or decrease the volume on your AirPods. I am assuming here that you have basic knowhow on using Apple Siri, the voice based assistant on your iPhone. So when you wish to turn the volume Up or Down. So first thing you have to do is set-up your AirPods (either left or right) to invoke Siri. I mean its that easy to go to the comfortable volume levels without even accessing the iPhone. However say you are sitting in a library and can’t use the voice commands, then what? No issue, go ahead and use the second method. You can still adjust your AirPods’ volume from your iPhone. OR up from the bottom of the display on iPhone 8 and earlier iPhones. >> Touch and hold the audio card in the upper right corner of the Control Center. >> Tap on your AirPods in the menu that pops up. >> Now raise or lower the AirPods volume by sliding the volume button right or left. Finally when you have learnt, how to raise volume on iPhone, iPod or iPad, its not a good idea to listen to the phone on higher volumes, since its harmful in long run for your ears. Also what if there are kids at home and they can damage the ears easily listening to higher volumes? In that case you must know how to control or limit the Maximum volume settings on your iPhone, iPod, or iPad. So lets see how to set and lower maximum volume limit on any iOS device. Step-1) Lower the Maximum volume by tapping Settings >> scroll down and select Music >> tap Volume Limit >> pull down the volume slider to the maximum volume level you feel comfortable for your kids. Step-2) Now tap the back arrow until you’re back at the main menu. Step-3) Password protect Max vol settings – Head back into Settings >> tap General >> select Restrictions >> hit Enable restrictions at the top of the page and add a four-digit password. Now scroll down to where it says Volume Limit >> Tap it and change it to “Don’t Allow Changes” and then keep backing till you reach or exit to the main menu.